The registration fee for this competition is $15.00. The WCA Stripe payment system is being used for this competition. You will be prompted to pay following registration. You are not considered registered until you pay via Stripe. There will be no at-the-door registration accepted under any circumstances. Spectators may attend for free and Kent State University students, faculty, or other employees may compete free of charge. Please email the organization team to prompt us to waive your payment. Please note that the schedule and the number of those who proceed to 3x3 Round 2 and all finals may be changed during the competition. There will be a taco bar free of charge during lunch and will give each competitior 2 tacos. What remains of the taco bar after the competitiors will then be open to spectators free of charge. Additional food can be purchased on the first floor of the student center at multiple restaurants such as Subway, Fresco, Auntie Anne's Pretzels, Einstein's Bagels, etc. Other restaurants such as Buffalo Wild Wings, Twisted Meltz, Taco Tontos and multiple pizza places can be found in downtown Kent which is about a 15 minute walk from the venue! The Cube Depot has graciously agreed to sponsor this event. They will also be selling some puzzles at this competition, check back for more details regarding this! 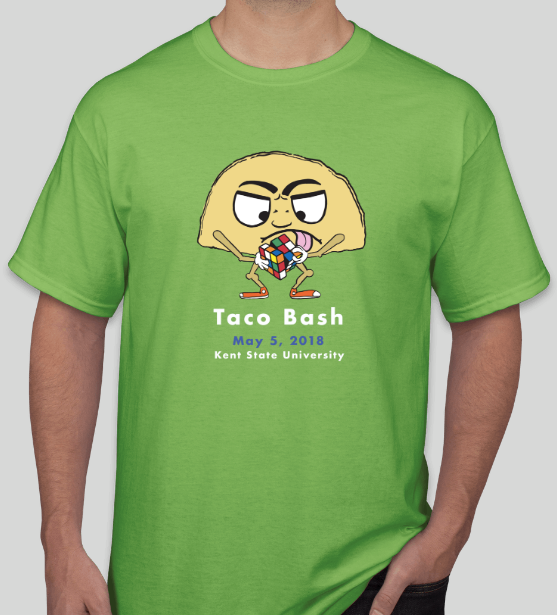 We are pleased to announced that Cube Depot will also be vending Taco Bash 2018 shirts! Shirt sizes will be available in S-XL at the competition on a first come first serve basis. The design was created by Kent State University's own Sophia DelCiappo, a Junior majoring in visual communication design, and Minoring in photo illustration. Since Summit Street is undergoing construction it is a one way road outside of the visitor parking lot.